Out-of-home measurement increased CNN's core demo ratings for James Comey's June 8 hearing by 18 percent. Three months after launching its national out-of-home reporting service, Nielsen shared some early data and showed that OOH ratings can increase the in-home audience for sports and news events by almost 20 percent. Nielsen execs talked about out-of-home measurement—which incorporates TV consumption in environments like offices, airports, hotels, bars and other people’s homes— during the Television Critics Association’s summer press tour in L.A. While much of the company’s presentation overlapped with Nielsen’s total audience ratings briefing in April—“If they’re doing it on a TV, we’re tracking it,” said Brian Fuhrer, svp of product leadership—execs had new insights to share about out-of-home viewing and the streaming habits for SVOD services like Netflix and Hulu. 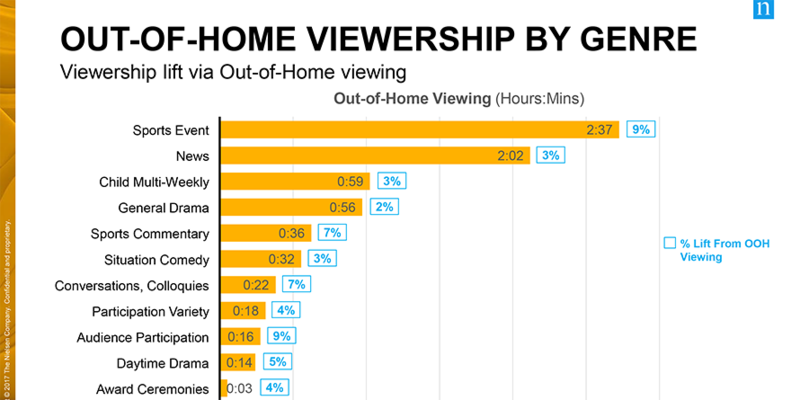 During the first five months of the year, Nielsen found that viewers spent an average of 2 hours, 37 minutes watching sports events outside of the home and just over two hours (2 hours, 2 minutes) watching news. The other categories lag far behind those two, with less than one hour of out-of-home viewing between January and May. The company found that 10 percent of out-of-home viewing is from 6- to 17-year-olds, 26 percent is 18- to 34-year-olds, 32 percent is 35- to 54-year-olds and 32 percent from people over 55. 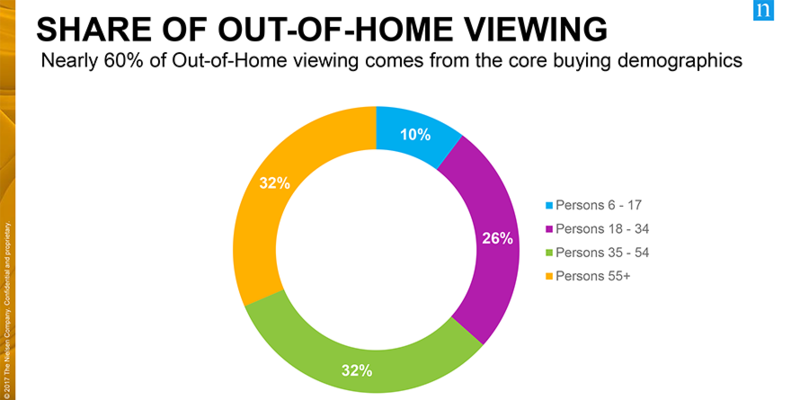 In January, out-of-home viewing led to an 8.8 percent total day lift in the 18-49 male demo. The early fringe daypart was up 11.3 percent, late fringe increased 4.3 percent, prime time jumped 8.3 percent and weekend daytime saw a 9.5 percent lift. The same month, cable news networks saw a 6.2 percent total day left in their key 25-54 demo. Early fringe increased 5.6 percent, late fringe was up 3.1 percent, prime time jumped 4.5 percent and weekend daytime saw a 4.7 percent jump. 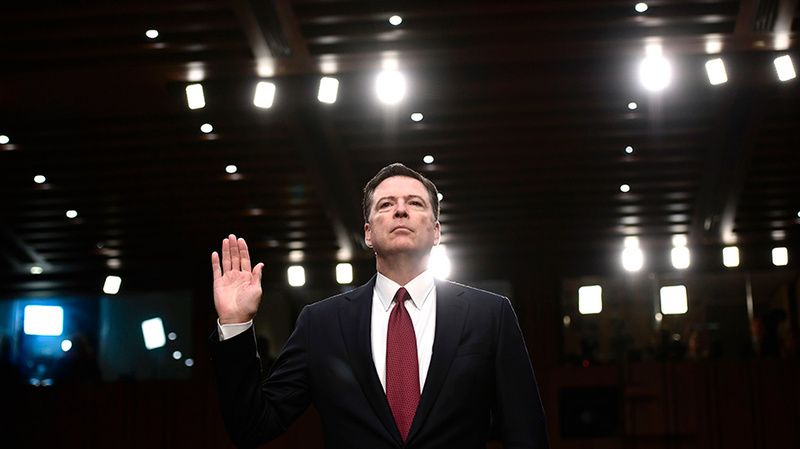 During former FBI director James Comey’s testimony on June 8, out-of-home viewing saw an 11 percent lift among broadcast networks in the 18-49 demo, while cable networks received a 17 percent increase. CNN alone received an 18 percent increase in its 25-54 demo above the network’s live-plus-7 delivery. Kelly Abcarian, svp, product leadership, noted ESPN’s out-of-home viewers during that time period skewed more female (36 percent of out-of-home viewers, compared to 30 percent in-home) and younger (31 percent of out-of-home viewers were in the 18-34 demo, versus 22 percent in-home). And out-of-home measurement also captures cord-cutters, as 25 percent of 18- to 34-year-olds who watched ESPN out-of-home live in homes that don’t have cable. 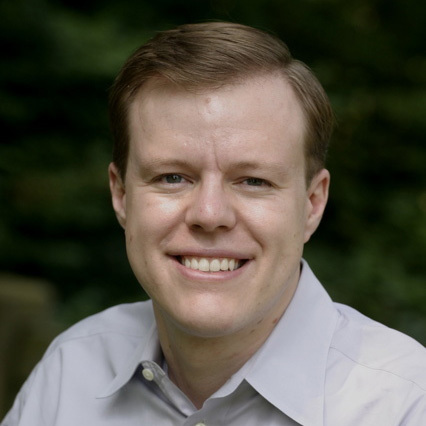 Out-of-home measurement is “a big opportunity” for the industry, said Fuhrer. Nielsen execs also shared new data about streaming services, showing that streaming accounts for 13 percent of all TV usage among all OTT-capable homes. Of that streaming subset, 50 percent of those users are watching Netflix, 11 percent are viewing YouTube, 7 percent are watching Hulu and 6 percent are viewing Amazon. The other 26 percent are watching other streaming services and platforms.